If you want me to come and talk at your event, school, pub or somewhere else, here are some talks I can offer. If you’re after something else…a talk on an entirely different topic, for a specific age group, a panel discussion…please get in touch and let me know what you’re after. For more general information, see my presenting page. Ageing seems inevitable, but can we slow the process down, or even reverse it? A single change to the DNA of a nematode worm can double its lifespan; mice fed less than normal can live 50% longer; and some creatures never seem to age at all. Are these hints that this seemingly fundamental process could be flexible? And could this one day lead to real anti-ageing medicine? Suitable for GCSE or A-level students, and the general public. Suitable for GCSE or A-level students, and the general public. 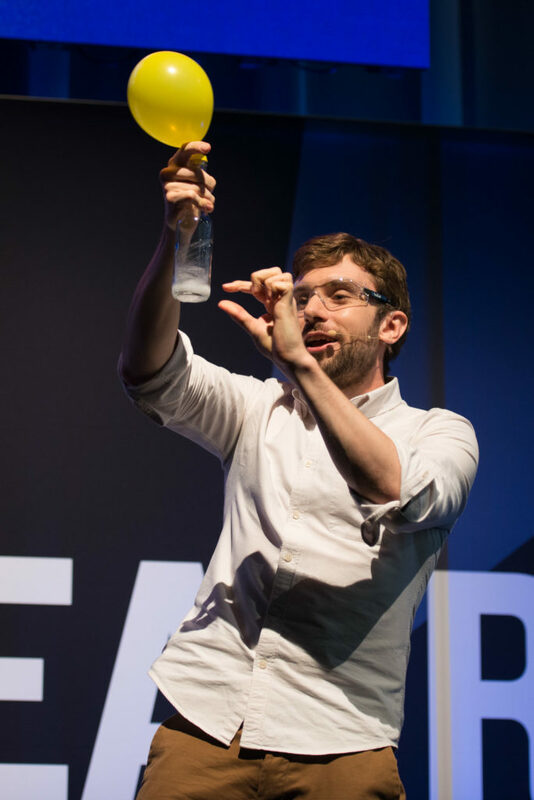 This talk contains demonstrations with liquid nitrogen! If this isn’t available, I can show videos instead…but it’s not quite as cool. For a sample of this talk, check out the Lab, Camera, Action! video about maglev trains. Cancer kills a third of us, and yet we spend less just £2.80 per person per year on public-funded cancer research—and cancer is by far the best funded condition. The Scienceogram takes a sideways what we spend on science, in formats ranging from a seven-minute stand-up set to an in-depth hour-long lecture. See scienceogram.org for more information, or watch a short version from the Science is Vital event in 2015.